ELV has this theory that Restaurant Charlie Pastry Chef Vannessa Garcia is a savant (not an idiot savant, you idiot) but a savant, as in: a wise, learned person, skillful way beyond her 25 years. Idiot savants can look at a pile of toothpicks and tell you exactly how many there are, while dessert savants can, without any formal training, turn extra large, juicy, basil-infused California blueberries, along with some semolina pudding, tarragon semifreddo and lime-basil sorbet into something extraordinary to the eye and palate. How many pastry chefs do you know that can meld a bunch of discordant ingredients like Himalayan goji berry ice cream, spiced cranberries, persimmons and quinoa (pronounced KEEN-wah), into a harmony of flavor and texture? One in which the integrity of each ingredient is respected, yet the whole becomes greater than the sum of its parts. ELV has maintained for years that Vegas has the deepest collection of pastry talent in the country. 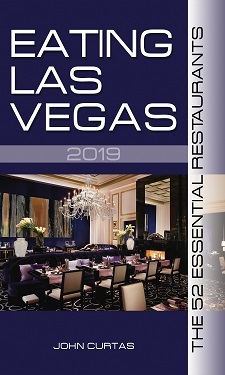 We’ll put the desserts of any of our top spots up against any in the good old U.S. of A., and with a never-ending succession of inventive, tasty treats, Vannessa and her cohorts keep us intrigued and sated, night in and night out, up and down the Las Vegas Strip. Really, these desserts look horrible. The first one looks like a vegetable plate explosion. These are not artistic nor refined desserts. Apparently she never learned to quenelle sorbet. The petit fours composition looks like it was given no thought to the plating. Good evening. I’m having trouble with your blog. I can’t see the pictures. Is everyone having this problem? I have been having trouble with my computer lately, so I’m not sure if its my equipment or if its your website. Thanks! Hey there! Excellent idea, but might this truly operate?